The 500 square mile Newberry Volcano, just south of Bend, includes thousands of acres of breathtaking scenery making it one of central Oregon’s most spectacular places to visit. 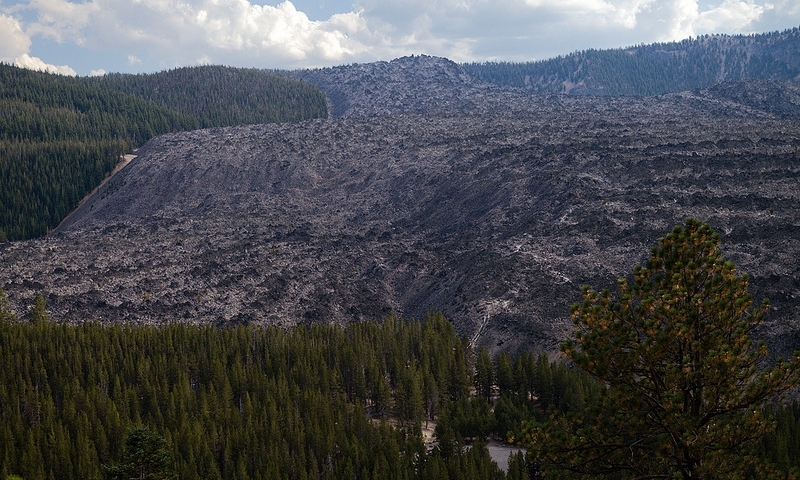 Just 10 miles south of Bend in the beautiful Deschutes National Forest is the Newberry National Volcanic Monument. Spanning over 55,500 acres, the monument includes spectacular lava flows, sparkling lakes, and fascinating geologic formations. The Newberry Volcanic Monument was designated in 1990 in order to protect the beautiful and unique landscape surrounding the volcano. Locals and visitors alike enjoy camping, hiking, fishing, horseback riding, boating, snowmobiling and cross country skiing at this popular destination. The Newberry National Monument is located 10 miles south of Bend via Highway 97 and is accessible year round. Contact information: Deschutes National Forest, 1001 SW Emkay Drive, Bend, OR 97702. Phone: 541-383-5300. Visit the website here. Fishing – There are two alpine lakes at Newberry Crater that contain trophy-size rainbow trout and brown trout, as well as salmon. Camping – Seven campgrounds provide excellent camping near the lakes. Horseback riding – There are several miles of equestrian trails to explore as well as a horse camp. Hiking – Several scenic trails, including the Peter Skene Ogden National Recreation Trail, wind through the crater. Hikers may also enjoy exploring the Lava River Cave. Whitewater rafting and kayaking – The Wild and Scenic Deschutes River flows through the lava along the northwest border of the Newberry National Monument. Newberry Volcano Oregon is one of the largest shield volcanoes in the country, spanning over 500 square miles. It is still active. You can drive through the volcano’s summit, which covers 17 square miles. The volcano was named in 1903 after John Strong Newberry, a geologist and explorer. Astronauts in the Apollo program trained on the Moon-like surface areas of the volcano.